The Offpiste UltraPack 7+3 is a flexible, versatile, configurable (and any other word that means you can do anything with it!) backpack for the active athlete. It has loads of modular options giving you the ability to organize your “stuff” in any configuration necessary. This helps your items stay put regardless of the activity you’ve chosen for that day’s adventure. At first glance, the Offpiste UltraPack 7+3 appears well constructed and durable. After putting it through its paces for multiple activities, it stood up (and performed) admirably. When initially trying on the pack and getting it sized correctly for my body, I will admit it was a tad confusing. Perhaps the pack I received did not contain the full “instructions” which would have helped me along. After watching the online videos of the Offpiste UltraPack 7 + 3, the features and functions became more obvious. Staying on the “features and functions” part, the pack is loaded with options and configurations that are sure to satisfy your every storage need. With zippers that open additional space, straps on the back for oversized items (jackets, etc.) and even little details like the mesh helmet wrap and rain “fly”, the pack literally does it all. With that in mind, the size of the Offpiste UltraPack 7+3 should be noted before your expectations exceed it’s capacity. This is not a pack for all of your stuff. It is really designed more for the “day” adventures only. I did not use the “over the shoulder” straps, but it appears that they would be very useful if you did not want to have your pack strapped to your back for a specific part of the day. When removing either of the optional pack attachments, I found the top straps to be very useful as well. These make carrying the pack around (and not attached to your back) very easy and functional. One of the more impressive functions of the design of the pack is the ventilated back section. 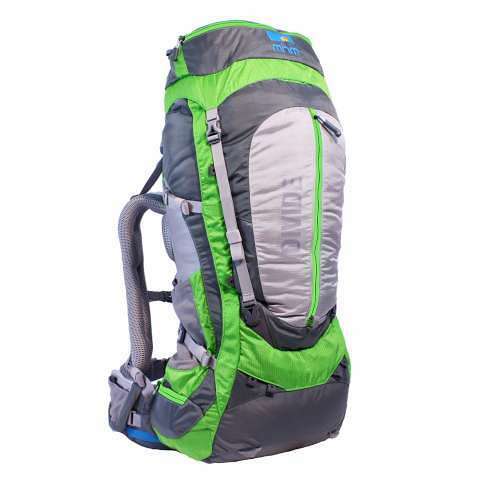 Many packs try to keep the air flowing with lighter weight designs, etc., but the Offpiste UltraPack 7+3 stood above the rest in this department. We have all experienced the sweaty backpack-back regardless of the temperature. This pack keeps the air flowing nicely even with the snug fit. Lots of goodies in the box. The strap configuration is also unique and, for lack of a better word, effective. I initially assumed it would not be snug enough to “stay put”, but I was proven wrong. I was even able to bend completely over and do a lower-back/hamstring stretch (head between my shins) and the pack did not budge. This was impressive. You can switch the strap to fit more comfortably over the left or right shoulder. After wearing the pack for over an hour, I switched sides. It was a simple and quick change and it was nice to be able to alter the side. That said, I also found that the strap was wide and padded enough that I never felt like I “needed” to switch. It seems that this feature would mostly be aimed at personal preference. Once I chose the correct clip/strap to unclick, it was very easy to swing the Offpiste UltraPack 7+3 around and access the items inside. This feature came in quite handy while mountain biking, since stopping to grab a snack or take a picture tends to be a hassle with a standard pack. I also used the pack for running a few errands around town and putting items into the pack was made rather easy (in the checkout line) since I didn’t have to remove it all the way. A couple of nit-picky items that I thought could use improvement: I would like to see a hole for the Camelback hose. This is standard in many packs and is likely an easy fix. I also thought the water bottle wrap was a little ambitious. I used a standard Nalgene and regardless of how hard I tried to tighten the strap, it still slipped out. The picture on their website shows a Nalgene with a neoprene cover. This (or anything with some texture or grip) is likely a perfect solution to this. Lastly, I really loved the “LightPack 4 System”. I will certainly use both sizes, but the LightPack 4 was perfect for trips to the gym and general around-town errands on or off the bike. With the various zippered pockets, flaps, hooks and places to attach items, you can bring almost anything you need along for the ride. 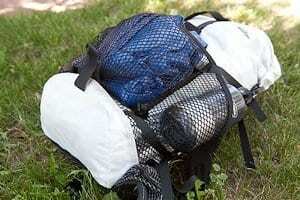 In general, this pack is built super-rugged and seems like it will last a lifetime. 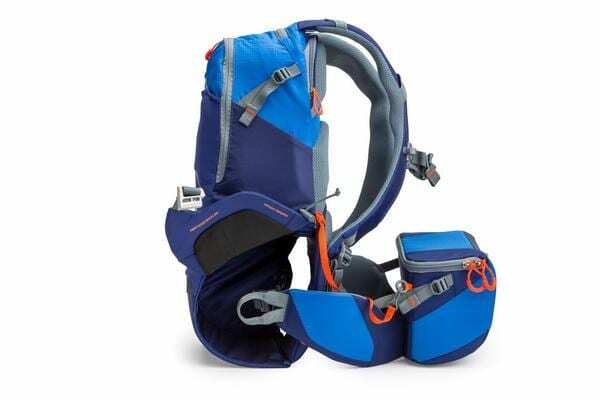 The multiple configurations are a huge plus and the size, weight and multiple compartments make it a very versatile pack for about any activity. The few hiccups I found were mostly personal preference and did not detract from the overall functionality or quality of the pack. Please see Offpiste UltraPack’s Kickstarter page for more information and your choice of pledges to help them meet their Kickstarter campaign goal! Jason Robie is the owner of Ridgeview Technology, LLC. He's worked in various positions including ski patrol, auto mechanic, irrigation technician at a golf course and back country care-taker for AMC. Currently, Ridgeview Technology supports clients from New Hampshire to Utah doing Social Media Project Management, Search Engine Optimization and custom web site deveopment. When not clicking away on his trusty mac, he is an avid cyclist (mostly road), hiker (all-season), skier, snowboarder, back-country tree skier and really up for anything that gets him outside in any season and any weather.